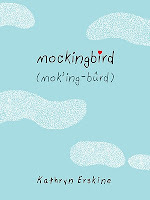 Mockingbird by Kathryn Erskine. (Grades 4-7.) Philomel Books, April 2010. Reviewed from ARC provided by publisher. Caitlin has a hard time relating to people. She sometimes can't tell how they're feeling from their facial expressions. She's almost completely literal. Caitlin has Asperger's Syndrome. In a confusing world where her classmates' faces don't always look like those on her Facial Expressions Chart and a teacher saying that she wants you to do something turns out to mean do it, Caitlin could always count on her older brother Devon to help her figure out what was going on. But now Devon is gone, a victim of a tragic school shooting that's rocked their small town. And Caitlin has to deal with not only her own grief, but the grief of her father and of their entire community. This is a moving story seen from a unique perspective. Caitlin and the other characters (notably Caitlin's dad, a single father trying to deal with his own grief as well as take care of his daughter) had me choked up in many different spots. But Kathryn Erskine has mastered that blend of humor with poignancy and I found myself laughing out loud in several spots, too. ...Her hands are on her hips and her head is moving up and down and she keeps leaning forward and back again. I think this means she's mad. Sometimes it means The Chicken Dance but I don't think that's what she's doing right now. Caitlin's story is one that will definitely stick with me. I'm thinking kids will dig it, especially kids who dig books like Lauren Tarshis's Emma Jean Lazarus Fell Out of a Tree or Kate DiCamillo's Because of Winn Dixie. You'll also want to make sure you have a copy of To Kill a Mockingbird (and the movie) around because they're mentioned in the book and would make a great pairing. Read more reviews at bibliochic, Successful Teaching, and Glitter Glue Library. And do check out this interview with Kathryn Erskine on Holly Schindler's blog and another interview over at The Furnace. Mockingbird will be on shelves April 15 (happy birthday, S!). I'm a big fan of Emma Jean, so I'll be looking for this one!